Here’s my top ten things to get kids outdoors and enjoying playing in the wild. Each of these items deserves a blog of its own, but until I get round to that, here they are (the first five). Nothing can beat a fire building session. There is so much to it: collecting stones for a ring or digging a pit, finding the wood, kindling and dry grass to get it started and stacking it all up like they show you in the boy scouts. Then, of course, there is the lighting – a match and firefighter doesn’t cut the mustard here, the challenge is to use natural tinder and a bow drill, or at the very least a Swedish fire steel. There are blogs, YouTube videos and forums galore on the art of lighting a fire in a stone-age stylee. You can’t build a fire without cooking some triumphal food to celebrate. Toasted marshmallows on a stick is what every child wants to do (squish between chocolate digestives for even more sickly delight) but more savory delights are bacon wrapped round a stick, potatoes wrapped in foil in the embers or sausages on a grill. If you want to be a real hunter gatherer then you’ll need to forage some food to cook on the fire. Once, near Arisaig, the kids found lots of small mussels and stuck over the fire on a grid they found. The mussels popped open and tasted just like pistachios, salty and moorish. If you have no grid or pan, put a pile of wet seaweed on a hot fire, stick the mussels on top and steam them. Other wild food we love: tasting the tart wood sorrel on a walk to quench our thirst (don’t eat many, they contain oxalic acid); foraging chanterelles at the end of summer; springtime wild garlic; nibbling the nutty newly sprouted leaves of hawthorn in April. Our kids are notoriously hard to get out for a good healthy walk. Scavenger hunts are good; Make a list of things they need to find on the walk: moss, a forked stick, a black pebble, and then set them off. A story stick gives something to talk over at the end of the walk too. Find a stick and attach a string to the top. While you walk, weave in objects you find along the way to make a record of the landscape, and nature of the walk. If all else fails then I find a long-to-never-ending story that I need to make up on the hoof using characters invented by the kids usually works. Mermaid’s purses, the papery bubbles of dog whelk egg-cases, bleached and smoothed wood, crackly seaweed, opaque blobs of green sea-glass, blue coils of marine rope. There can’t be anything better than launching off into space screaming on a rope swing, whether you are a child, or just wish you still were. My favorite is made from a buoy and a length of rope found washed up on the shore. It has a steep slope of just the right incline for launching off and swinging out miles into the void. The kids delight in showing me just how much higher up the slope they can launch off from. By the way, when making a fire, remember to leave everything as you found it. Ensure the fire is out and quench with water. Take out a turf before you make the fire and replace when you go. If on a beach make the fire below the high tide mark. 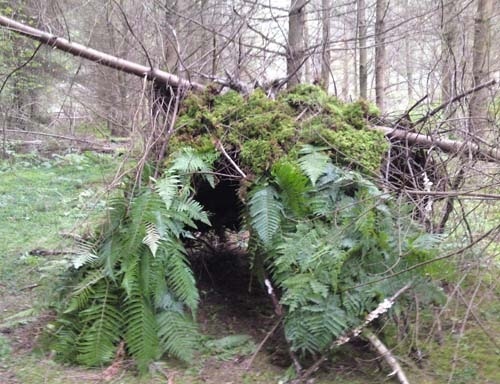 This entry was posted in Miscellaneous, Other stuff not near Cuil, Things for kids and tagged camouflage, fire, manhunt, Natural Play, Nature deficit, outdoors, play, wide games by nager. Bookmark the permalink.